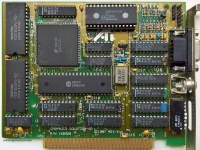 Low-cost professional 3D card for Windows NT 4.0. 09 April 2019	in 3Dlabs Inc. Ltd.
04 June 2014	in 3Dlabs Inc. Ltd.
Highend version with TV tuner and VIVO. 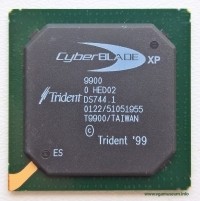 26 March 2019	in NEC Corp.
01 June 2014	in 3Dlabs Inc. Ltd.
27 March 2019	in Trident Microsystems Inc.
29 March 2019	in ATI Technologies Inc.
28 March 2019	in NEC Corp.
World's first LSI graphics- controller chip. 29 May 2014	in 3Dlabs Inc. Ltd.
2nd 3Dlabs try aimed on mainstream users. High-resolution graphics system designed for the PS/2 line. 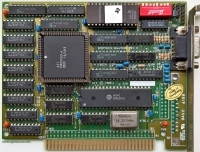 Graphic accelerator, additional card like the IBM PGC. 25 March 2019	in 3Dlabs Inc. Ltd.
Mid-range dual-monitor accelerator using 2x RPM 2/64 rasterisers. 18 March 2019	in 3Dlabs Inc. Ltd. High-end dual-monitor accelerator using 2x GLINT R3 rasterisers and GLINT Gamma 2 geometry processor. 17 March 2019	in 3Dlabs Inc. Ltd. High-end workstation accelerator using 2x GLINT R4 rasterisers and GLINT Gamma 2 geometry processor. Enhanced VGA compactible adapter for IBM PS/2 MCA machines. Budget competitor of GeForce MX4000. 23 February 2019	in ATI Technologies Inc.
22 February 2015	in ATI Technologies Inc.
20 February 2019	in ATI Technologies Inc.
16 February 2019	in 3Dlabs Inc. Ltd.
12 February 2019	in Chips&Technologies Inc.
High end Super VGA card. 28 July 2014	in Chips&Technologies Inc.
03 November 2017	in ATI Technologies Inc.
Professional mainstream card based on underclocked GeForce GTS 450. 06 July 2014	in Cirrus Logic Inc.
12 January 2015	in Trident Microsystems Inc.
09 January 2015	in Trident Microsystems Inc.
1st company chip - high end windows accelerator. Lowend Xabre with lower clocks. 27 January 2019	in Trident Microsystems Inc.